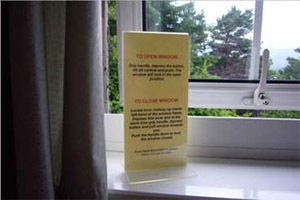 The art of opening and closing a window Opening and closing windows is normally a no-brainer. TO OPEN WINDOW Grip handle, depress the button, lift till vertical and push. The window will lock in the open position. TO CLOSE WINDOW Locate lever midway up inside left-hand of the window frame. Depress this lever and at the same time grip handle, depress button and push window toward you. Push the handle down to lock the window closed. If you have any problems please come and ask for help. The hardest part was closing the window. It required careful reading of the instructions and some trial-and-error. Luckily, I managed to close the window without having to call for help.